History and physical exam are essential to diagnose this injury. An x-ray of the injured finger is important to look for a possible fracture. Early diagnosis and treatment is important for treatment. What are the treatment options for a mallet finger? Fortunately most patients with mallet finger injuries can be treated successfully without surgery, even if there is a fracture. If the joint is in good alignment with the splint, surgery is not necessary. Non-operative treatment requires full-time use of a finger splint for at least 6-8 weeks. Light use of the hand and gentle range of motion of the uninjured fingers is encouraged. The splint may be removed daily to check for skin breakdown, but during this time the end joint of the finger (distal interphalangeal joint) should be kept straight at all times. Do not let the fingertip droop during the 6-8 week splinting program. 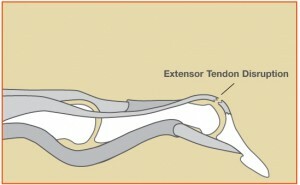 Removal of the splint and bending (flexing) the finger prior to healing can break apart the healing tendon fibers. Showering with the splint is allowed, but patients should dry the splint and finger afterwards to avoid skin breakdown. After 6-8 weeks of full-time splinting, the finger splint can be gradually weaned off. The splint should be used during sleep for 2-4 more weeks at nighttime. Hand therapy is occasionally helpful in improving range of motion and hand strength after the injury heals. It may take 3 months for strength and range of motion to improve to maximal. Occasionally surgery is offered to patients who have a large fracture or a joint which has slipped out of alignment (joint subluxation). What are the results from mallet finger treatment? Most people are pleased with their function and finger appearance after non-operative treatment. It is common for the fingertip to droop a small amount, even with diligent splinting. This is called an “extensor lag” and does not usually cause a functional problem. Some people notice changes in the nail growth, such as ridges or grooves, but these can smooth out over 6-12 months. Some people notice a “bump” on the top of the finger, just before the nail. Sometimes people do not regain full range of motion of the finger after the injury. However, the majority of patients report good hand function. The video below is provided by the American Society for Surgery of the Hand. Surgery is rarely needed for this problem. In my practice, surgery is only offered to patients who have an unstable fracture or a joint which has slipped out of alignment. Surgery in these cases involves using screws or temporary pins to keep the pieces aligned while the fracture heals. In some cases, the fracture can be aligned “percutaneously” with pins without the need for an incision. The pins are removed in the office once the injury heals. There is a risk of infection and wound breakdown with surgery. Therefore the decision to undergo surgery is carefully evaluated.